Scopri Miami e il meglio che ha da offrire con questo tour di 3 ore in minibus in una delle più coinvolgenti città della Florida. 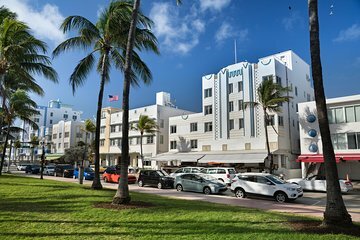 La guida ti farà scoprire la famosa scena musicale e artistica di Miami mentre ammiri quartieri iconici, come Coconut Grove, Coral Gables e Little Havana. Lungo il tragitto, potrai ammirare il fantastico skyline della città e la celebre architettura in stile Art Déco. I was picked up at Bayside market 45 minutes past time. Then I was taken clear across Miami to another pickup point with no talking or explanations. Changed to a shuttle, then picked up more people. Wasted a good hour. Finally started tour. Very short. Not informative. Made only one stop, when there were supposed to be 3. Very disappointed. This was a good tour covering Miami Beach, Little Havana, Wynwood Walls, and you have the option to get off at Bayside and conclude the tour or go back to your pick-up point. I do wish we had more time in Little Havana and Wynwood Walls. Tamara is very knowledgeable about Miami. This tour was very disappointing. First, they picked us up at our downtown hotel and drove us to their Miami beach office, about a 40 minute drive with no narration on anything. Once there we had to wait for the tour bus to arrive. The guide did narrate in both English and Spanish as we drove around the city. We were supposed to have three stops Coco Walk, Little Havana and Wynwood. We only stopped at Little Havana. The guide started off telling us it was a four hour tour. After leaving Little Havana he stopped at Bayside market and said they we now ready for the city boat tour. We did not signup for that. He said we could now pay for the boat tour or stay around Bayside until 4 pm when he would drive everyone back to their hotels. We were only on the tour for 2 hours and our hotel was across the street. So, we just walked back to the hotel and considered this tour a total bust. It looks like they included us with the city and boat tour and just expected we'd do the boat tour with everyone else. They are sold as two different tours and we never did get the other two stops. Would not recommend this tour as it did not deliver as advertised. We had a french tour guide which was hard to understand her English .Very disorganized and disappointing.